The Kingdom of Guge, founded in the mid 9th century and became a focal point for the preservation of Buddhism in Tibet until the 17th century. Tholing and Tsaparang are the ruined former capitals of the ancient Guge Kingdom of Western Tibet and are rarely visited by the western travelers. Tholing, once Western Tibet’s most important monastic complex exists today in ruins. It was founded by Rinchen Zangpo, an India returned scholar and the greatest Sanskrit translators who played the key role in reviving Buddhism across the Tibetan plateau. Tholing is accessible in one day by jeep from Mount Kailash. Tsaparang, about an hour's drive west of Tholing is most probably the greatest interest to those with some knowledge of early Buddhist art. The ruins of Tsaparang extend along a ridge with two main areas of interest: the Red and White chapels and the Tsaparang Dzong. The ruins consist of ancient summer and winter palaces. The Red and White Chapels have the best of Tsaparang's murals. We spend three nights in Lhasa a Buddhist Capital visiting the famous Potala Palace, the Jokhang, great monasteries and walk through the bustling Barkor market before taking drive towards Manasorvar. We drive through central Tibet via Turquoise Lake (Yamdrok Tso) and visit the cultural and religious centers of Gyantse and Shigatse. 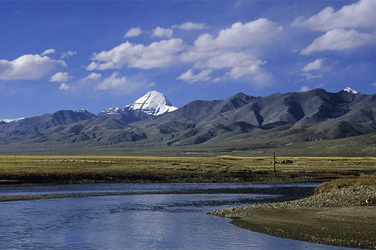 We then drive across the wide-open spaces of the Tibetan Plateau to Lake Manasarovar. At Lake Manasarovara, you will have an extra day to explore the shores of the holy Lake. Religious travelers will perform rituals and meditation at the lakeside. Day 17 / 18 Lhasa Sightseeing tour. Day 19 Early morning transfer to Gongar airport for your flight to Kathmandu.